I didn’t aim for her. Instead, I winged the paper airplane at another kid. But it was more poorly crafted than I expected and it flew by the kid, soared over my classmates’ heads, and landed squarely on the teacher’s knee. The class erupted in laughter. That was it! Red-faced, the poor substitute marched me to the principal’s office. Once there, I was threatened with the dreaded “call to the parents” and sent back to the classroom. Sufficiently shamed, I apologized to the teacher, plopped in my chair, and promptly fell asleep. Back then, kids like me weren’t called ADHD; they were called “brats.” It took a very long time to have the public understand that ADHD was a real condition and that medication could work. And as a psychiatrist, I have often promoted and prescribed these meds. But over the years my thinking began to change as to who really needed them. It began when I noticed traits in my own children that I would have medicated in others. My son was classic ADHD. Yes, he was high strung, yes, he was “all boy.” But from a psychiatric standpoint, I could see he suffered from severe ADHD: poor attention span, bored easily, and unable to sit still or focus on his homework for more than 10 minutes at a time. When he found something of interest, though, he could focus for hours, even days at a time, like when he was 8 and decided to learn the name, location, and capital city of every country in the world (there were 156). He did so in a couple of weeks. Still, I struggled with the temptation of putting him on medication – yet something kept me from it. After some tough adolescent and teen years, he found his stride. In college, and as an adult, he thrives in an atmosphere in which he juggles many tasks and wears multiple hats. He is proficient in five languages, and has travelled the globe (his goal now being to travel to every country in the world he learned about when he was 8). He teaches English along the way as a means of support. He’s three-quarters of the way there. How is it he went from a struggling adolescent barely passing certain subjects, to a university honor student and successful adult? Miraculous! Then there was my daughter. Even as a 7 year old, she made her bed so perfectly you could bounce a quarter on it – and look out if you dared touch it before she was ready to go to sleep! She was methodical, kept herself on a budget, was always on time, and paid attention to EVERY detail. Her perfectionism was her defining character trait; she could be very obsessive, and her obsession with order and neatness did cause problems. I realized that if she had been brought to me as patient, I would have diagnosed her as OCD, but she was a good student, never in trouble (except when pointing out the teachers’ organizational shortcomings), and whenever a project came along needing attention to detail, she was the one the whole family turned to. Most importantly, she seemed happy in her own skin. 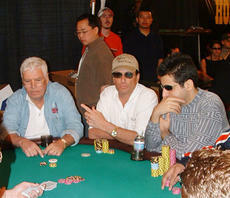 My real breakthrough in thinking came, ironically, from the World Series of Poker. Let me explain: A few years earlier, my house and office had been destroyed by Hurricane Rita and my family life demolished by divorce. My children were grown and living away from home. I knew I had to re-invent myself but I didn’t know how. I had taken up playing poker as an escape and I was pretty good; I had an uncanny knack for reading people, being able to tell when they had a hand or were bluffing. In fact, at times I could name the exact two cards my opponents were holding. It was a combination of intuition, gut feeling, and a bit of magic, so I called it magical thinking. I quickly progressed and began playing in national tournaments. I had a lot of hypo-manic energy and could easily meet the demands of a poker tourney where you sit and play for 12 to 14 hours a day, for a week straight. I loved the spotlight of being a big time player. I was interviewed on TV, appeared on ESPN and felt like a star. I won more and more until eventually I found myself at the Holy Grail: The Main Event of The World Series of Poker in Las Vegas. Imagine that: A shrink playing professional poker in Vegas! I came in 11th in the world in 2004. After that, I felt that perhaps I had found my niche. I resolved to start playing more big-name, multi-million dollar events, while limiting my psychiatric practice. But, trouble quickly surfaced. It was one thing to play an occasional poker tourney for fun, but quite another to play six to seven days a week in event after event – I was bored silly! By 2008 I knew the life wasn’t for me, yet decided to play the Main Event one more time before figuring out where to go from there. I busted out quickly (my heart just wasn’t in it) and went to my favorite piano bar in Vegas, ordered a vodka martini and started to think. Why was I a good poker player? Because I was a magical thinker, I had lots of energy, I enjoyed the TV spotlight, and when I sat at the table, it was all about me and my decisions – nothing else mattered. Hmmmm… I thought: These traits were like mild psychiatric diagnoses. Magical thinking – schizophrenia; high energy – hypomania; loved the attention- histrionic; self-focused – narcissistic. I then considered my other traits, and there were some biggies: Bored easily, short attention span and the love of new adventures – ADHD! Yikes! You couldn’t be a successful long term poker player with that…UNLESS you were medicated, that could work. But, did I really want to take a psychostimulant just to play professional poker? Then I started thinking about my kids: a son who was clearly adventurous – and clearly ADHD – traveling the world. And a daughter who was a perfectionist – borderline OCD – who became a successful event planner. Not to mention my sister, who is very shy – perhaps to the point of social anxiety disorder. She was able to forge a career from home as an attorney doing appeals via the internet with almost no client contact. Hah! Almost everyone I knew had certain traits that could in some cases represent a diagnosis… so then I wondered on a scale of 1-10, what separated an ADHD 8 from an ADHD 10 and who got medicated and why? How could one person use a set of “symptoms” as a springboard for success while another with the exact symptoms needs meds and therapy? It was a eureka moment. The very conditions that I had treated for the last 20 years, when not causing significant psychological trouble, were the basis for so many individual success stories. How could I have just figured that out? I realized that my profession had not only redefined mental health by over-diagnosing, over-treating, and over-medicating, we were also taking away the hope of human nature by telling our patients that they were inherently “abnormal,” and needed to be fixed. The psychiatrists office had gone from being the place no one would be caught dead visiting… to the place where a pill could fix anything… and psychiatry itself had gone from being stigmatized to glamorized. The solution was simple: To embrace the idea that unless your ailments are seriously impeding your quality of life, they can be used to your advantage. If my son or daughter or sister or I had walked into a doctor’s office and presented our “problem,” how radically different might our lives be today? The mental health profession must change its entire approach to what defines mental health and mental illness. We must stop thinking how to give the patient what they think they want and start with the premise of taking a look at what’s good about what they have. We must empower individuals to think it’s ok to be “not normal” to change the mindset that everything can be “fixed” with a pill or a few therapy sessions, to understand that what they perceive as their worst trait, may in reality be their best. It’s time for a new order of things in mental health, based on the premise that when you try to conform to a perceived “normal,” you lose your uniqueness – which is the foundation for your potential greatness.